When last we left the saga of Snoodie's beloved BFF "BLUE BEAR", David and I had attempted to introduce two replicate bears into Snoodie's habitat with zero success. This failure has left us, like so many parents before us, living a life that is sadly dominated by concern regarding the whereabouts of a goopy and grotesque bundle of blue fur. 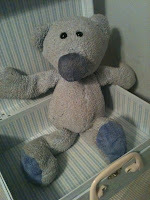 Blue Bear's life has not been an easy one. 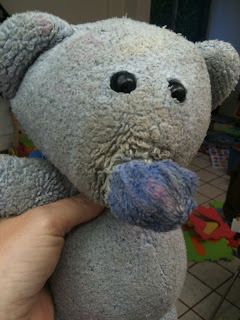 Blue Bear was on the front lines for the "Great Stomach Flu of 2009" and required several trips through the washing machine by the time the puke quit flying. He's been dragged through the mud and peed upon more times than I can count, but through it all Snoodie's love for him seems only to grow. In the ensuing months things have taken a turn for the decidedly grosser. While teething, Snoodie developed the habit of chewing on Blue Bear's face for roughly 14 hours out of the day. Nowadays we remain in a constant state of high alert - fearing that at any moment representatives from the CDC may descend upon our home wearing hazmat suits and looking to confiscate Blue Bear indefinitely in order to study him for new and menacing viral strains. In light of this harsh reality, David and I have been forced to come up with a dastardly option. Indeed it is a plan so vile, so deranged that its very existence has caused me to question the darkness that must lurk in the depths of my soul. And as much as I would like to tell you all about it....I HAVE A PLANE TO CATCH! That's right, folks. Husband and I are off to Massachusetts for 3 child-free days of bliss at a B&B for the wedding of one of my oldest pals! I'm as giddy as a schoolgirl! But please, tune in next week for the hideous details of the monstrous terribleness that is...OPERATION SPARE BEAR PARTS. In the meantime, do what you can to prepare yourself mentally.